The Mediterranean is made for basking on beautiful beaches, and with 300 days of sunshine a year these idyllic islands are the perfect place to roll out your towel. Heavenly coastal highlights indulge even the pickiest of holidaymakers, so it's a shore thing you'll find a spot that will have you reaching for the sunhat and shades. Between rock pools, towering cliffs, sparkling seas and turquoise lagoons – there are few places as dramatic and diverse. Not to mention the islands are often hailed as one of Europe's best diving destinations! Without further ado, let's dive in to the best beaches in Malta & Gozo. Holidays and the beach go together like buckets and spades, so what better way to get things started than with this Blue Flag beauty? Mellieħa Bay (also known as Ghadira Bay) is Malta's longest stretch of sand and a fantastic way for families to spend the day. Gently sloping golden sands and shallow waters are wonderful for little ones, while big kids can enjoy the huge range of wet and wild watersports on hand. Windsurfing, waterskiing, sea kayaking and banana boating are just a few ways for adrenaline junkies to get their fix! If fast-paced action couldn't be further from your idea of relaxation, then spoil yourself with a spot of sunbathing. There's nothing quite like dozing off under the Mediterranean sky, with the soothing sounds of gentle waves lapping against the shore. Twenty minutes or so from Mellieħa Bay sits the gorgeous Għajn Tuffieħa. Maltese for 'Apple's Eye', this beach will capture your heart almost as soon as you lay eyes on it! Another blissful stretch of coast proudly flying the Blue Flag, this north-west wonder is a must. Cocooned by high rocks and clay cliffs – it's the perfect place for a pin-drop peaceful afternoon. Descend 100 steps or so to the red sands below, and relax to the sound of the crystalline waters caressing the shore. Lined by tamarisk trees, Għajn Tuffieħa feels like one of the best kept secrets on the island. A romantic setting for loved up couples, watch in awe as the soft, iridescent golden glow of the sun kisses the cove as it sets. Outdoor enthusiasts will appreciate the nearby natural park and clifftop walking trails. 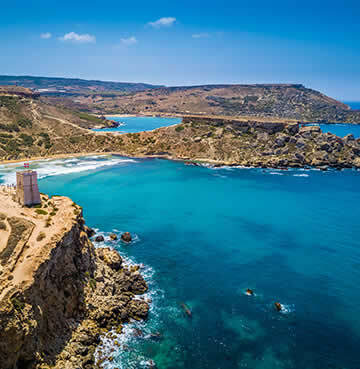 Hailed as one of Gozo's most picturesque beaches, Ramla Bay is a hit amongst locals and holidaymakers alike. Enveloped by twin rocky headlands and nestled at the bottom of a valley, the villages of Xaghra and Nadur are nearby. Sand dunes line the back of the beach, and are one of the rarest habitats of the entire Maltese archipelago. Where the dune ends, the soft, red sands of Ramla begin. Great for families, there's something to keep everyone entrained. Whether your kids are keen to get splash happy, or you simply want to sunbathe – this beach wrote the rule book on leisure and pleasure. Perched on the cliffs on the western end of the beach is Calypso's mythical cave. Overlooking one of the best views on the island, head here to drink in the raw natural beauty of the bay all at once. Unspoilt and untouched, you'll spot the remains of the Marsaliforn Tower on the valley floor below. The cave is often open to the public – so be sure to investigate if you're able! Fitting an unbelievable amount of amazing natural wonders into one place – it's no surprise Dwerja Bay is the most visited location on Gozo. Sweeping seascapes of dramatic coastal formations, craggy caves and an Inland Sea all culminate to create a dazzling day out. The area was also once home to the iconic Azure Window, which was unfortunately destroyed in a storm a few years ago. The whole area is now a protected heritage park and UNESCO World Heritage Site, and when you're admiring its unique traits it's not hard to see why. The Inland Sea is a popular swimming and snorkelling spot, connected to open water by a narrow tunnel through the cliffs. This most definitely isn't your everyday beach! Small fishing boats line up by the jetty to take travellers on a 25 minute ride from the Inland Sea to the other side of the cliffs. The trip is wildy scenic, and conveniently brings you up close and personal with all the best bits. As if all that wasn't enough, the area is home to one of Gozo's top five dive sites – the Blue Hole. Crystal clear waters with visibility of up to 30 metres showcase the underwater paradise in all its glory! Beautiful reefs and coral gardens explode in a kaleidoscope of colour, while fish flurries of all shapes and sizes dart in and out of their hideouts. No 'Best Beaches' list would be complete without the bucket list beauty that is the Blue Lagoon. 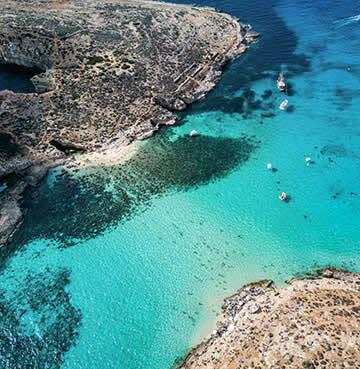 While technically not on either Malta or Gozo, it's lovingly sandwiched between the two – just off the shores of captivating Comino. One of the worst kept secrets of the archipelago, this beach makes it on most people's must-see attractions. Perfect for a relaxed swim or snorkel, the calm turquoise waters are every bit as vibrant as they look in pictures! 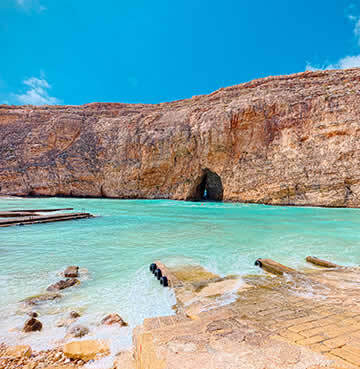 Once you've had your fill of sunbathing and splashing – there's a breathtaking coastal trail that'll lead you to a few of the lesser known bays of Comino. Holiday bliss! Set sail from a range of places for that extra special feeling of style and comfort, or go for a more authentic experience and make your way to the lagoon using public the fantastic ferry system.